Katie Trautz (www.katietrautz.com) is a native Vermont fiddler who has toured nationally and internationally sharing traditional music and original folk songs. Katie plays fiddle, guitar and banjo crossing genres with her numerous ensembles. She has studied with some of the greatest fiddle players in the US including Dirk Powell, Pete Sutherland, David Greely and Bruce Molsky. Katie has released a number of albums in the past seven years with her various bands (Mayfly, Chaque Fois and more). 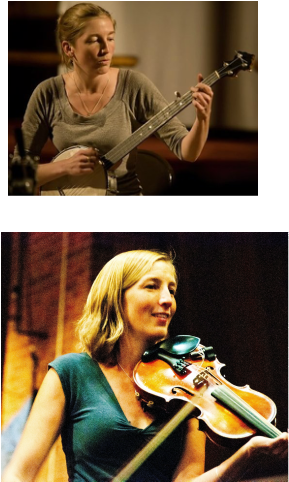 Katie is the co-founder of the non-profit folk music school ‘Summit School of Traditional Music and Culture’ based in Montpelier, VT. Following her 8-year directorship at the Summit School, she became the Executive Director of Chandler Center for the Arts in Randolph, VT. After the release of her book 'American Harmony Singing: Kid Songs' in the fall of 2016, she decided to return to teaching music, while raising her new baby son.